You are here: Home » Employees Provident Fund » How to Calculate EPF Dividend? How to Calculate EPF Dividend? 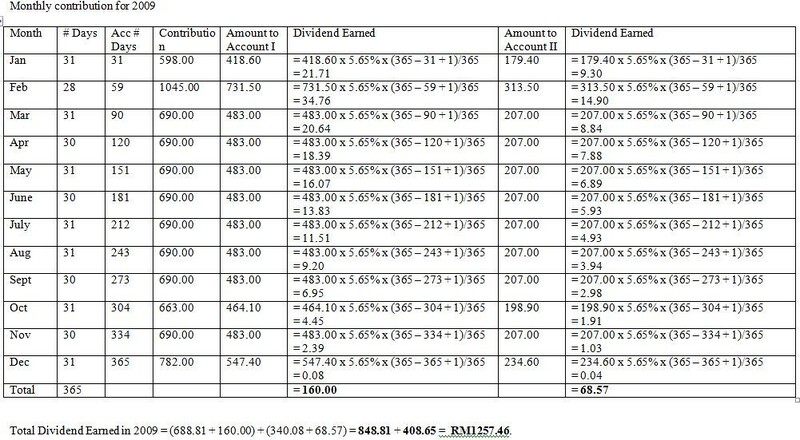 The calculation for EPF dividend is not straight forward. It is not calculated by simply multiply the total contribution or year end balance with the declared dividend rate. Monthly contribution start earnings dividend only on the last day of the month irrespective the actual day the monthly contribution is deposited. For withdrawal, dividend for the withdrawal sum is only eligible up to the day prior to withdrawal day. No dividend will be given on the withdrawal day. Total Yearly Dividend = Sum of Daily Dividends. You have to continue doing this until December 2009. In the end you have sump up all the figures to obtain dividend for both Account 1 and 2. Too complicated? Don’t worry. You can use online “EPF Dividend Calculator”. 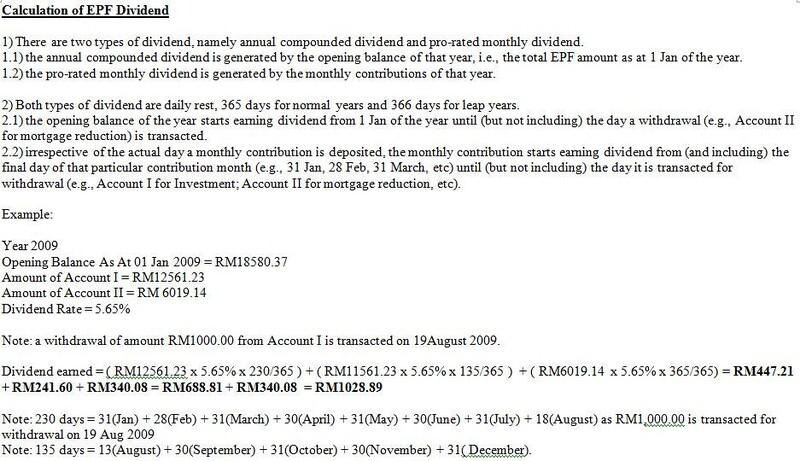 Thanks to 1-million-dollar-blog readers, “marx” who shows us on how to calculate EPF dividend correctly. Read the comments on following post for reference. Calculator EPF (KWSP) How to? You take the effort to combine both the “annual” & “monthly” dividends, that’s good ! You even have the online EPF Dividend calculator now. That’s one of its kind and perhaps the ONLY ONE in Malaysia ! That’s great ! I just check my 2010 EPF statement online. It is 5.8% for year 2010 dividend rate ! You leave your MONEY in EPF RM 100K and you only get RM 464.39 per month !!!!. What a STUPID LOL are WEEEEEEEE??????? To ALL my friends “Get out that MONEY” thru EPF investment scheme and invest in EPF UNIT TRUST either Conventional or Islamic. Good price sell and returned back to EPF. Nowadays ALL MANAGERS keep on finding a way to built a BRANDNAME for themselves,where in actual “BRAIN” they are “CROOKs” and “THIEVES”. OPEN your EYES WIDE and look at “THEM” closely.Dont be temted by that BEAUTIFUL SPEECH or overwhelming presentation ada udang disebalik batu. I am confuse on a scenario, where if I would to return the money from investment into my epf account will I entitle for the dividend on the returning amount? Sam, I believe you will entitle for dividend from that date the money deposited into your EPF account. For that particular amount, you are not entitle for dividend for the whole year but base on the number of days within the year base on the above calculation. Hi, wonder if you know about epf balance which has exceed 1 million ringgit. I heard anything above that wont be getting the full dividend but only 2.5%.